Paksiw is essentially cooking food with vinegar and is closely associated with fish. Having a hot and humid weather like we have in the Philippines, I guess it was just natural to find ways and means to preserve food. And vinegar was just the right thing. Fish can keep for an extended length of time when cooked by paksiw. Incidentally, this method also goes well with roasted meat, be it chicken or pork. Lechon, or roast pig, is especially popular in celebrations. 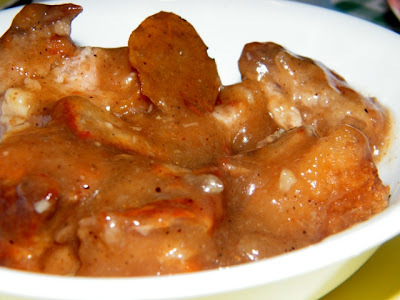 In the event that there are leftovers, this can be transformed to yummy lechon paksiw. But you do not need to wait for leftovers. Cook up some pork and convert it to paksiw! Rub pork with salt then place in pot and cover with water until submerged. Bring to a boil then simmer until pork is tender. Remove from heat, cool it down a bit for easy handling then chop into bite-size pieces. Heat up cooking oil in a pan and fry the pork pieces until lightly browned. Set aside. Add some more cooking oil then saute garlic and onion. Return the pork pieces and add the lechon sauce, bay leaves, and sugar and mix. Add the vinegar. Do not mix. When it starts to boil, cover and reduce heat to simmer until sauce thickens (about half an hour should do it). Season with salt and pepper to taste. This work is licensed under a Creative Commons Attribution-NonCommercial-ShareAlike 3.0 New Zealand License. Theme images by carlosalvarez. Powered by Blogger.